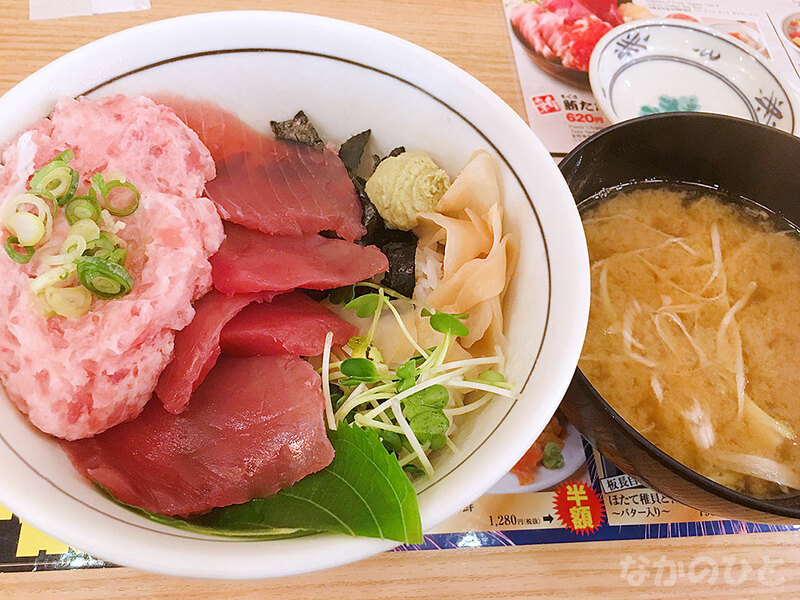 I was looking for places where I could eat seafood rice bowl easily at lunch after Iso Maru Fishery was in another shop, which was in Nakano Sun Mall Arcade. There was an alternative shop. It is Mekiki-no-Ginji. It is a 24-hour izakaya located in a narrow street with a Kozie corner. In the menu, I ate a Tuna Tataki & Tuna rice-bowl that I was pushing as profitable during the service time. According to the menu name, there are Tataki and sashimi on it. I think that there is a preference for ingredients in the ingredients, but it is a combination of condiments and seasoning, spreading laver and feeling time and trouble. I did not notice it in the menu, but miso soup also came. I think that this is where you like, but you can not see rice as you see in the image. The amount of tuna is large in proportion to rice. I do not know if this shop's standard is this, but if you want to eat a little rice a little, but you want to eat fish, it is just right. It was a bowl of tuna which was eaten a lot. This page contains a single entry by shannon published on September 7, 2018 8:23 PM. Shop inverse appears in Nakano Sun Mall was the previous entry in this blog. Landscape of lanterns of Nakano Sun Mall is the next entry in this blog.